The number refers to the seventy years of history, which is truly unique for any marque in the sport. The letters in the name stand simply for Scuderia Ferrari and the Hybrid form of power. The Italian flag is clearly visible on the “sail” of the engine cover, with a look that recalls the 70s. 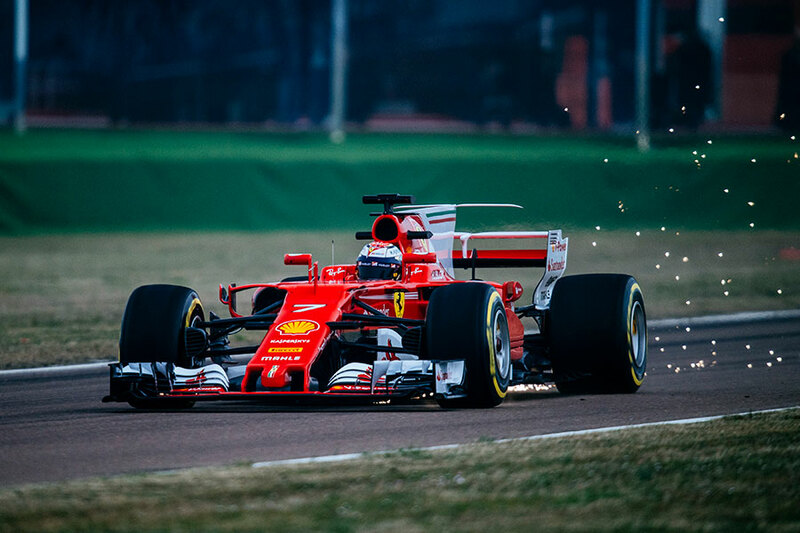 After the launch, the Ferrari SF70H, built to compete in the Formula 1 World Championship, also took its first steps today at the historic Fiorano track, combining the shakedown with a filming day to acquire footage for commercial purposes. The car is made up of 56 thousand components, produced thanks to the work and collective effort of the thousand or so men and women from the Gestione Sportiva, over a gestation period of twelve months. The car is visibly different to its recent predecessors, as a result of regulation changes for 2017 aimed above all at increasing performance. The shutters to the Fiorano pit garage, which had been decked out in a unique look just for the test, came up at 09:45 Italian time, watched by the President and CEO of the Prancing Horse Sergio Marchionne, Team Principal Maurizio Arrivabene, Technical Director Mattia Binotto, the drivers Kimi Raikkonen, Sebastian Vettel and Antonio Giovinazzi and all the staff, who were watching the presentation from nearby in the Maranello headquarters. After the routine preparations, the car drove out of the garage at 11h20, fitted with the “Demo” tyres which have to be used on filming days. They were to the same larger sizes as this year’s tyres, but the compounds were different. It was certainly a rare sight, seeing a current year model Formula 1 car running on Ferrari’s home track: the rules no longer allow in-season testing, apart from the collective ones for all teams. The sole exception is in fact the 100 Kms allowed for a promotional day, which first Raikkonen and then Vettel made the most of , splitting the allowed distance equally between them, despite the rain which delayed Sebastian’s first run until 15h40. Once the day’s work was over, all the employees got the chance to see the SF70H up close, before the car was loaded up onto a transporter, ready to head for the Catalunya Circuit, where the first of two pre-season test sessions gets underway. Each session runs for four days. Vettel is due to drive on Monday and Wednesday, with Raikkonen taking over for Tuesday and Thursday. The second test gets underway on Tuesday 7th March.